Welcome and thank you for joining us for our Edit-A-Thon! 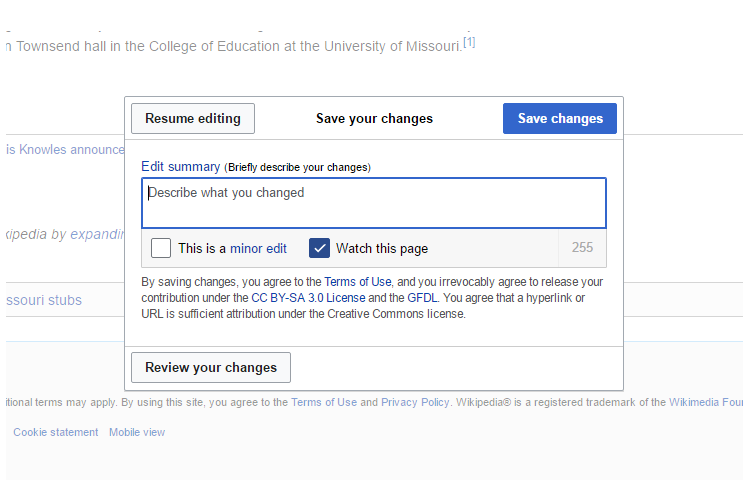 The goal of our Edit-A-Thon is to increase the representation of Missouri women on Wikipedia. We want to share the knowledge we have about women from Missouri who have helped shape the history of the United States. The first step is to create a Wikipedia account if you haven't already done so. We have created a few stub articles that you can choose from if you are having trouble finding a topic. 1. Search Wikipedia to make sure your article topic doesn't already have an entry. For your convenience we have provided several links to other articles to view to help you get an idea of how you would like to format your article. Once you have logged into Wikipedia, find the link to the sandbox on the upper right hand corner of your screen. For those who have chosen a topic on the provided list above, go straight to the article stub by searching for it, instead of opening the sandbox. Once you have found the visual editor, use the provided tabs to add headings, templates, citations and links to your article. If you are using the same resource, you can re-use that resource by pressing, cite then re-use. ​Link your article to other relevant Wikipedia main space pages by pressing the link button. Remember, any changes you make to your article need to be saved. You can do this by hitting the save changes icon near the top right of the screen. After you hit save changes, indicate the changes you have made as shown below. Infoboxes can be added by clicking the insert tab then searching for infobox under template. This will add an infobox which can be used as a quick reference of information for visitors. Or, flag down one of our many volunteers to assist you. Remember, we are here and happy to help you! 5) Is your article layout easy to follow? Now that you have completed your article and double checked that it is truly ready, it is time to add your article to Wikipedia! 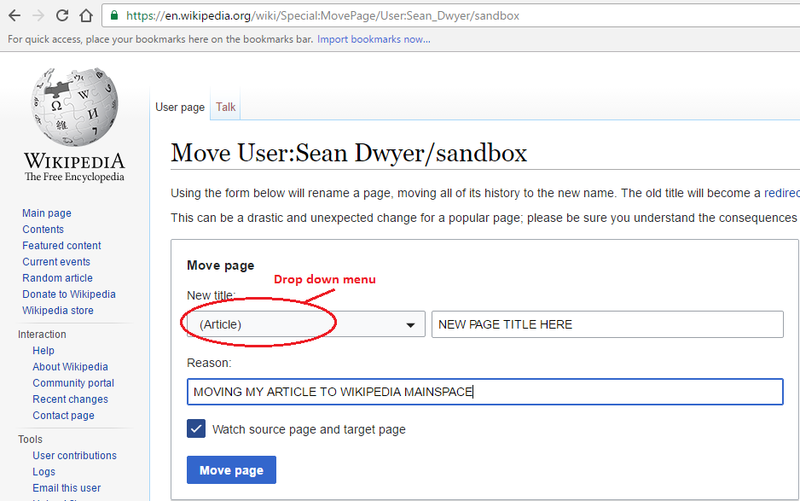 4) Give a reason for why you are moving your page, this could be as simple as, "Moving my article to Wikipedia Mainspace"
Congratulations! You have successfully added an article to Wikipedia! What do I do now that I am finished? You can continue to edit your article at your leisure or add to other articles. This can be an ongoing project that will ultimately add to the knowledge base that Wikipedia has to offer and will contribute to giving credit to women and women's organizations that helped shaped the future of Missouri and the United States. ​Once again, we thank you for your participation in our Edit-A-Thon and hope that you learned a great deal about the history of Missouri women and how you can share their accomplishments with the world through the Wikipedia Online Encyclopaedia. If you have not already done so, we invite you to fill out our sign-up sheet so we can see what you have contributed to our Edit-A-Thon.